I had the pleasure of meeting Justin in person for the first time at MAGFest 2013. I remember exactly how I felt as I was about to attend my fist ever MAGFest. You see, even though I have been a member of RetrowareTV.com dating back to even before I was making MOTU videos and other toy reviews, I’ve always felt a little like the odd man out. I was the “toy guy” in a community filled with video game players. The focus of my show was on video game related toys and action figures, but not every gamer is interested in that sort of thing. So heading to MAGFest, I knew at the time I was stepping into some new territory for myself. All of these guys with their amazing video game knowledge were on another level than myself, as far as I was concerned. I always considered myself very lucky to be a part of this group considering, and I didn’t know how MAGFest was going to turn out for me. Much to my relief, every single person I meet for the first time at MAGFest were terrific people. They all were familiar with my work, were very kind and friendly, and made me feel like I really did belong after all. One of those people was none other than Justin Carmical. I was familiar with his work online, but had never spoken to him before that weekend. But he was so warm and welcoming, and we instantaneously became friends. For the entirety of the weekend he was always there in the our groups that went out for lunch and dinner. I can still remember some of the conversation we had over lunch, when he would vividly describe some of the Japanese dishes he loved to eat. He really enjoyed food, it seemed. And it was just amazing to hear the level of excitement in his voice when he would describe some of the stuff he had eaten. That same weekend, I got to join a group of guys from Retroware to go game shopping with The Game Chasers, Billy and Jay. Justin was also a part of this trip. It was an incredibly fun experience getting to do some retro game shopping with these guys, all while being filmed for their online series. I remember Justin picking up the various import games in the store, since that was his forte. I remember him showing me several different games and explaining the plots to me, telling me which ones were a lot of fun and giving me his recommendations. When that amazing weekend was over and I was on my way out of the hotel to meet my shuttle, Justin was the last person I said goodbye to. He was in the hotel lobby, and I just happened to pass by him on my way out. We hugged each other good bye. That weekend had an incredibly positive effect on me. And I’ll always treasure it. This year, I was fully planning on attending MAGFest again. I was all set to go meet up with my Retroware family whom I had not seen since last January. But at the last minute, I had to cancel my trip plans. My son was born two weeks early…14 hours before I was supposed to get on a plane to MAGFest. The birth of my son was the best thing that has ever happened in my life, and while I really missed getting to see everyone at MAGFest, I was so happy to be home for my son’s arrival. However, looking at it now I’m a bit sad that I didn’t get to spend one last weekend with Justin. This whole situation is incredibly sad and confusing. It’s hard for me to understand how anyone could take their own life. Especially Justin. He was always so happy and warm. But it really makes you realize the strong face some people must put on when out in public. It pains me to think that Justin was hurting, and that there wasn’t something I could do. Even if we weren’t incredibly close friends who spoke every day, I still feel that way. I wish I could have helped. Rather then pondering about “why,” I am now doing my best to focus on the memories I have with him. He obviously had quite an impact on many people, as I’ve seen so many kind things said about him across social media today. So Justin, I hope wherever you are now, you see that. I hope you know how much you meant to us. And I hope you are now at peace. I’m going to leave you all with this video. It’s the episode of Game Chasers that was filmed at MAGFest last year. It’s goofy and silly, but it’s the perfect way to put a smile on my face and remind me of the time I had with Justin. That's terrible news. Sorry to hear of this loss. The news of a friend's suicide is never an easy blow to recover from. Take solace in knowing you made him smile during your time together Dan. Strength to Justin's surviving family members in their loss as well. Hey Dan. I hope you read this. I watch this page all the time but rarely comment. My condolences about your friend. I have some personal experience with this topic, but from the OTHER side of it. Depression is a difficult thing to navigate. I attempted suicide shortly after New Year's Day, 2000. All of my friends and family started pouring out of the woodwork, asking what they could have done to prevent my actions and why they didn't know something was wrong. I had no answers for them, because there are no answers. There was nothing they could have done. I wasn't well, but I had gotten EXTREMELY good at appearing well. It was the space I was in and the only one who got me out of it was me (and, the hospital that pumped the pills out of my stomach). Thank you very much for your post. It really means a lot, and I appreciate you taking the time out of your day to post. I've been doing just that: remmebering the positive. I've spent the past few days reflecting not only on the time I had with him, but also on the time I've had with all of the friends I have meet. I want to appreciate my time with everyone. I'll never forget Justin and the impact he had on my life. His memory will always live on with me. Thank you for this post. Like Dan, I too have kept thinking was there anything we could have done to change things. I feel a little better after reading this. Again, thank you. I'm sorry for your loss Dan and a Good Journey to your friend. It is really good to hear your thoughts on Justin. Like you, we met him at last year's Magfest also. Great memories, right? His death shook me to the core. 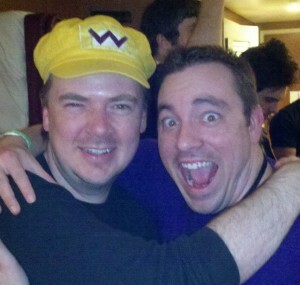 I know we all missed you at Magfest this year. You had the best of reasons though. Congratulations by the way on being a dad! I'm so glad you and Justin decided to come out and film with us that night. It's cool we have a narrated home movie of the experience to go back to whenever we want. I don't know if you had a chance to check out our tribute video of Justin. Watching the interview footage he gave us really made us smile. I loved it when he called you Danny! Anyways, hope the baby and wife are good. Here's to seeing you next year! Melvor! Really missed seeing you this year too, man! Yeah, I watched your tribute video. It was fantastic. Great footage there, and getting to hear Justin talk about our experience really brought back some great memories. And yeah man…him calling me Danny was really great. Made it feel very personal, you know. Watching that made me feel a little better. I miss him a ton.